← San Francisco: InterContinental Hotel’s Hot Deal "The First Anniversary Package"
Is that really? No… it couldn’t be. I think I’ve found… The Gates of Heaven? Or close. It’s… The Nelly! Can a hotel’s nickname get any better than that? Bono, Alicia Keys, Kate Moss… if they’re gonna fly off on a jaunt to Cape Town, they say, ‘Might as walk through the pearly white gates’ (or rather, the fancy white columns). This is where they rest their weary heads: The Orient-Express’ iconic Mount Nelson Hotel (also known as ‘The Nelly’). 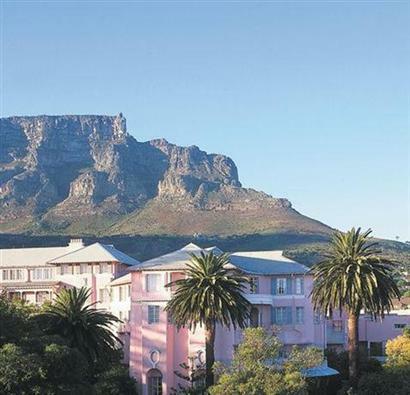 Just check out that prime location with sweeping views of South Africa’s famous Table Mountain. South Africa… what can we say? It brought us Nelson Mandela and the hope for freedom, now realized. So we say, begin the day with a stroll through their gardens and you’ll no longer need to imagine yourself ‘Out of Africa’ because, yes, you’ve arrived. Next, head to the renowned Librisa Spa for The African Wellbeing Experience beginning with a lavender soak and concluding with a vanilla and wild ginger massage. That should work up your appetite. We also recommend, for those who can (and can’t) afford to stay the night, tea time with five different kinds of teas, tiny finger sandwiches, savory quiches, scones, cakes of every shape and size, and big bowls of strawberries, fruit salad and blueberries. 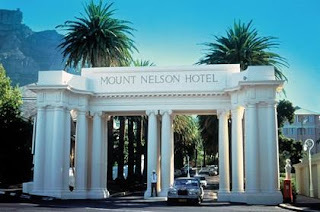 Prepare for a night of stars at the Mount Nelson’s Planet Champagne Bar where you can mingle with stylish Capetonians and other guests from across the globe while sipping exotic cocktails under a twinkling fiber optic Milky Way. It won’t come cheap, but we can tell you this much… you’ll be hard pressed to find a better spot overlooking Table Mountain on the tip of this promising continent. Room rates begin at $650/per night. This entry was posted in adventure travel, africa travel, cultural travel, luxury travel and tagged adventure travel, africa travel, cultural travel, luxury travel. Bookmark the permalink.